Ready for the next generation of equine nutrition? If you said yes, then Mansfield Feed Mill has just the product for you! The new hot selling product Renew Gold is presently stocking the shelves at Mansfield Feed and is selling faster than we can put it out! With the use of three sources of natural vegetable oils, a unique profile of high quality protein, and healthy digestible fiber. 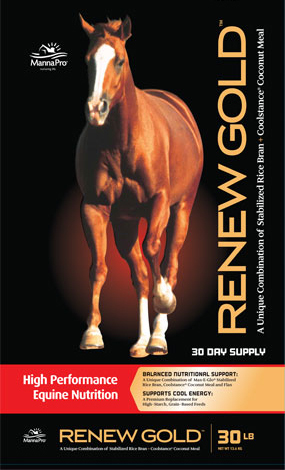 Also mixing in Renew Gold™ allows you to minimize the amount of feed concentrate needed in your feeding program, while our fermented yeast culture helps your horse maximize the nutrition naturally found in its hay or pasture. Lastly, for anyone concerned about the chemical make up the product, rest assured that all Renew Gold products are made with All Renew Gold Non-GMO ingredients.